Boris Johnson breached Commons rules by not declaring a financial interest in time, a committee of MPs has found. The Committee on Standards said the former foreign secretary had failed to register a share of a Somerset property within 28 days of acquiring it. The committee accepted he had not intended to conceal his interest and had apologised. But it added the Conservative MP had shown an "an over-casual attitude" to parliamentary rules. 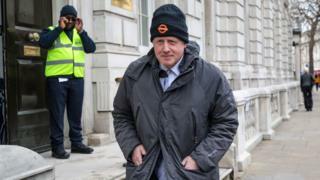 The reprimand follows a similar finding in December, when Mr Johnson was ordered to apologise over the late declaration of £52,000 in book royalty payments. In its latest report, the committee said the failure to declare the property interest in time revealed a "pattern of behaviour" regarding respect for rules on declarations. It added that Mr Johnson had given an assurance as part of the previous investigation that his interests declaration was up to date, but this "proved not to be the case". It recommended Mr Johnson, MP for Uxbridge and South Ruislip, should receive a briefing from the Registrar of Members' Financial Interests on his obligations. It added a further breach might lead to a "more serious sanction". According to the committee's report, Mr Johnson acquired his share in the property in January 2018 but only registered it a year later. He told the Parliamentary Commissioner for Standards he had not thought it necessary to register it, as he had initially misinterpreted the rules relating to the threshold above which an interest has to be declared. The commissioner, Kathryn Stone, said she accepted this explanation but that Mr Johnson "should have checked more carefully what was required of him". "That does not demonstrate the leadership which one would expect of a long-standing and senior member of the House," she added. In a letter to the commissioner, Mr Johnson said he accepted "full responsibility for the error". But he added: "Having now carefully reviewed the rules again... I do feel that they could be clarified so as to reduce the possibility of confusion." The committee rejected this, concluding the issue was not the rules themselves, but Mr Johnson's failure to consult the accompanying guide for MPs. His brother Jo, a former minister and current Conservative MP for Orpington, has also been found to have made a late declaration for his share in the property. He apologised to the commissioner in February, after admitting the fault and saying he had found the rules on declarations "ambiguous". He had been allowed to correct his financial interests register by way of a Commons procedure intended to rectify minor breaches. The commissioner concluded that Boris Johnson should not be afforded the same opportunity, because he had failed to check his entry properly during the previous probe into his book royalties. This showed an "additional lack of care and attention to the rules which apply", she found.